Even if humans stop producing excess carbon dioxide in 2100, the lingering effects of global warming could span the next millennia. The results? By the year 3000, global warming would be more than a hot topic -- the West Antarctic ice sheet could collapse, and global sea levels would rise by about 13 feet (4 meters), according to a new study. Even if humans were to stop emitting excess carbon dioxide -- or if they figured out a way to completely capture it -- the effects of global warming would continue to accumulate. That's because previously emitted carbon dioxide lingers in the atmosphere and the oceans, unlike land, warm only gradually, according to one of the study researchers, Shawn Marshall, an associate professor of geography at the University of Calgary. A number of gases contribute to global warming, among them carbon dioxide, methane and nitrous oxide. The study focused on carbon dioxide, because it is the principal greenhouse gas, and it can linger in the atmosphere for centuries, according to Marshall. "Some of the carbon dioxide going into the atmosphere this century will be there still 1,000 years from now," he said. Marshall, lead researcher Nathan Gillett of the government agency Environment Canada, and their colleagues found that, by the year 3000, the brunt of the changes occurred in Southern Hemisphere. Not surprisingly, the 2100 scenario yielded more extreme results. In particular, the model predicted that southern oceans - the combined South Pacific, Atlantic and Indian Oceans, where the Antarctic Circumpolar Current resides - would warm considerably, with some far-reaching results. The 2100 scenario highlights stark differences between the Northern and Southern hemispheres, according to Gillett. In the north, "the changes, which will occur up to 2100, some of those will reverse partially, it will cool a little bit after 2100, the rainfall in high latitudes will tend to decrease," he said. "The biggest ongoing change is in the Southern Hemisphere." This is because the Northern Hemisphere is covered primarily by land, which warms and cools more quickly than water. After emissions drop off, warming over land is expected to decline fairly quickly, Marshall said. Not so with water, which dominates the Southern Hemisphere. The long-term warming seen there occurs because this century's elevated temperatures would continue to propagate into the oceans for many centuries, even after warming at the surface has eased, according to Marshall. The researchers found that warming would be concentrated most the further from the equator (at higher latitudes) at ocean depths between 0.3 and 0.9 miles (0.5 and 1.5 kilometers). The model showed these waters would warm very little by 2100 -- but by 3000 they'd likely increase by 5.4 degrees Fahrenheit (3 degrees Celsius) in parts. But this isn't the only factor that could contribute to southern warming. A deep current from the warmer North Atlantic is moving (and would continue to do so), slowly toward the Antarctic, carrying warmer water with it. In addition, intensified winds could help mix warm waters into the southern oceans, and finally, the loss of Antarctic sea ice would allow more heat to enter the ocean, Marshall told LiveScience in an e-mail. 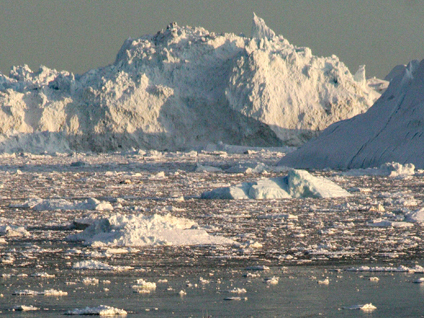 The researchers found, however, that the Arctic sea ice has recovered from its losses by 3000. While the 2010 scenario calls for a sea level rise of 9.1 inches (23 cm), the 2100 scenario would generate a sea level rise of more than 3.3 feet (1 m) due to the thermal expansion of the ocean. It's even possible the warming waters could reach the Antarctic ice, the researchers speculate. If so, the result could be the collapse of the West Antarctic ice sheet, which holds 500,000 cubic miles (2.2 million cubic kilometers) of ice. This would mean at least another 9.9 feet (3 m) of global sea level rise, according to the researchers. If we stopped emitting carbon dioxide now, which would bring us close to the 2010 scenario, it's unlikely the ice sheet would collapse, Gillett said. In addition, the simultaneous warming of the south and the cooling of north may cause the intertropical convergence zone - the region where the northeasterly and southeasterly trade winds converge, forming a band of clouds or thunderstorms near the equator - to shift southward. As a result, the drying predicted for North Africa could continue even after emissions are stopped in 2100, and the region could lose an additional 30 percent of its precipitation, according to the researchers. While the legacy effect of carbon dioxide lingering in the atmosphere has been demonstrated by others, other research has yet to predict the warming of the high-latitude southern oceans, according to Gillett and Marshall. "It would be really important to see this in some other climate models to see if they find the same result, because every model has its own set of uncertainties," Marshall said. The study was published online Jan. 9 in the journal Nature Geoscience.